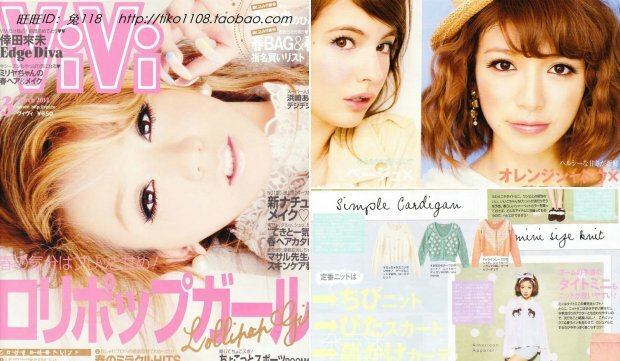 Vivi JP magazine, March 2012 issue - mag scans | Memorable Days : Beauty Blog - Korean Beauty, European, American Product Reviews. Finally, the march 2012 issue is out. It was damn hard to upload the previous issue, since a lot of download websites were down because of you know why ¬¬ .. *sigh.. Anyways, thank you all for recommending mediafire, which I'm using now at the moment to upload the VIVI issues. If you haven't checked the previous issue, you can easily CLICK HERE and enjoy the February mag scans :). Follow me on facebook, twitter and/or Bloglovin' if you don't want to miss out any Vivi magazines anymore! As you can see, Koda Kumi is on the cover of the March issue. There is a short article at the beginning of this issue about this amazing singer. Further, you will find a lot of Spring looks with pastel color clothing. Also, you will notice some cute dresses with animal or ribbon prints. Oh my, I really want to wear blazers, but sadly it's still too cold to wear them here. I've seen so many cute blazers in this issue, I can't wait until it's Spring! At the back of the March issue you will find some useful make up and hair tips as well :). Would you like to read the whole Vivi March 2012 issue? DOWNLOAD. Wow! The outfits are super cute! I super heart Japanese magazine!!! Cute outfits :) Love your blog. Would love you to check out my blog, maybe we could follow each other? Hi I have a question. M using iPad and could not download the magazine, any help? hahaha... how can you ever get bored xD?